We Indians are natural cricket players. All we need is something that resembles a bat ( a wooden plank/board/stick/ or a willow) and something that resembles a ball ( paper ball/rubber ball/tennis ball/ or any nut). 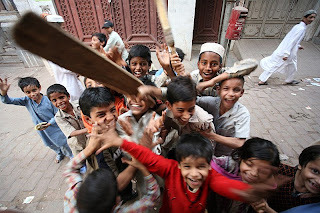 Cricket flows in every one's blood. It starts in school level itself, even inside class rooms in the form of Book cricket. Those days, I was a good spinner. But as time went by, I started paying attention to writing and stopped playing cricket. Last week, I decided to make a come-back to cricket. I went to the cricket field and saw some school kids playing cricket.They were around 10 years of age. I begged and pleaded with them to include me in their team. Finally they agreed when I told them that I would give them ten bucks each. The game started.Our team went in first.Wickets fell down like nine pins. I went in as the 5th batsman. The little boy bowled like a devil. The first ball, I faced was a full toss that landed on my groin. I was on the ground. It took me some time to recover. The second ball was a bouncer that zoomed past me. The kids were laughing at me.I survived for ten balls and even scored two runs through a deflection. Finally I was run out. Our team finally made 86 runs in 15 overs. It was our time to bowl and I knew that with my bowling skills, the opposition team would fall down like a pack of cards. I was asked to open the bowling attack. I ran up to bowl my leg-spinners. The first ball was smashed for a four. The second ball was hit back with brutal force and it reached the boundary too. The third ball was hooked for a six. That is when I decided to use my secret weapon -"The non-spinning ball". The fourth ball went for a six too.I didn't want to continue after such a humiliation. I told the opposition team batsman that I would not bowl to him, if he continues to hit me for sixes and fours. He laughed at me and I could not take such a sarcastical remark. It was such an insult to a great bowler. I told my team mates that I would conduct a strike against the opposition team. My team mates agreed with me when I told them that I would give them another ten rupees each. Me and my team mates left the cricket pitch and we never gave the opposition team another chance to smash us.Yes, I proved my mettle as a strike bowler. PS: I dint give the ten bucks to the kids.The kids are roaming around my house these days. What should I do now? Nice hairstyle... Rockstar!!! Ekdum badhiya you look..
hahaha...u must have had a great time....!!! n to the kids.....y do u cheat them yaar.....give them a chocolate..to them a rupee chocolate is more worth than a 10 rs note..!!!! Krrrrrrrrrrr... thu!! First of all very nice performance in the field.. now not even paying up the kids as you promised them.. !! give them a choco that will be cool tho :).. Anyway, Thank God u didn't play International cricket. You would looked like Inzy. good luck over there...hope u had a nice journey. 4. Play another match and promise you won't strike. Now, you ve to first play cricket with my younger bro and talk the rest out. He is just nine and swings his bat like one experienced with the nuances. Superb batsman he, i shld say. And dude, u got a cool hairstyle :P And i see transition with the pics, mean-the earlier one and the opnes u put up these days. And you are born to be a politician. TRUST. Those were the best of times! Another good one Chriz... take care! give them d money u miser!! Machi avan enga pothaalum adhikiraan da!!! Give yourself up! pay up or try wicket-keeping next time! Too much da... first you play with babies and then bowl a 'baby' over??? lolzzz-Why don't you hide somewhere behind the Indian Cricket Team? Best bet because then they won't notice YOU-they will be too engrossed in the players themselves! I have written a poem on my blog.Hope you get time enough to read it.. hey!! chris whr r u?? thanx a lots 4 ur comments.. ur blogs r too gud.. u opted out of orkut also..
heh heh .. strike bowler.. I never thought of it that way.. The cherry and willow are rendered rather useless.